I've been using a Yaesu FT817ND for just over 20 months as my primary rig. It is pretty good for what it is: a portable 5 watt radio that covers from 160 meters through 432 mHz. It's really not a bad radio, but like most rigs, it has its own set of quirks. Even after using the rig for a while, the menu system is a bit cumbersome. The LCD display is small. It's a good battery-powered portable rig, but draws a surprising high amount of current for that type rig. The receiver is OK but not great - I've added a 300 Hz CW filter which helps, but the front end does kind of fall apart during contests, especially on 80m. And for casual use, that narrow a filter can be uncomfortable to listen to for a lot of folks...even me, and I like a fairly narrow bandwidth. Early this year, ND4V was kind enough to loan me an Elecraft K3, and I discovered it is the finest radio I've ever used. A little pricey, but compared to top of the line rigs from Yaesu/Kenwood/Icom, it's really a bargain. 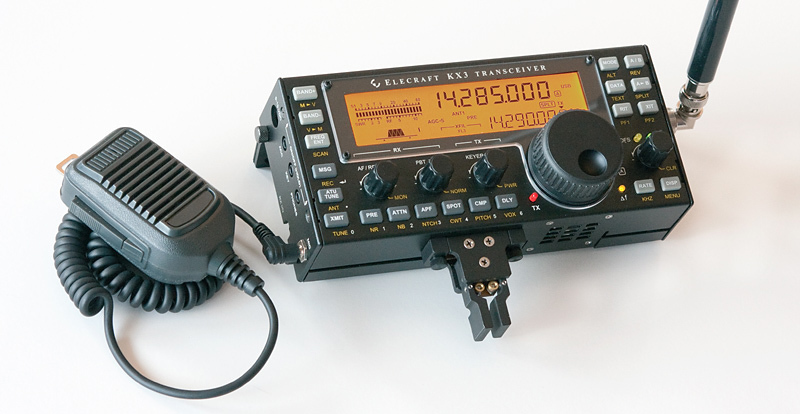 Around about the same time, Elecraft started shipping its KX3 - their latest portable rig, and it promised to be head and shoulders above the FT817 and any other commercially available QRP rig - either built or kit. Many referred to the KX3 as a "mini K3". I had had a chance to put my hands on a KX3 and knew that it "felt good", and was even able to operate one for about a half hour or so at the QRP gathering at the Huntsville Alabama hamfest this year and it seemed, at least ergonomically, to blow away the Yaesu. Then in August, Rob Sherwood tested the KX3 and added it to his table of Reciever Test Data. Wayne, N6KR, one of Elecraft's principles had mentioned the year before, pre release of the KX3, that he was certain the rig would be near the top of Sherwood's chart...and it was - it came in at number 1 of all receivers tested, even ahead of the K3! Now the ranking is done based on dynamic range, which is only one measurement of reciever performance, but it is certainly one of the most important criteria, if not the most important. It was plain from Sherwood's testing that the KX3 was something special: Superb receiver performance that you can hold in the palm of your hand! Bottom line is that I wanted a KX3 to evaluate to see if it was a worthy replacement for the FT817. I felt sure it probably was, but I didn't want to just "drink the Elecraft KoolAid". So, events transpired that I was able to acquire a KX3 just a few days before the CQWW CW contest...a perfect test! The first night of CQWW usually goes a bit slow for me, especially now that I'm limiting myself to 5 watts and only have an 80m doublet up about 40 feet or so. I figured it would be a perfect time to A-B the KX3 and the FT817. I used a BNC-Tee to split my antenna between the two rigs. I had an earbud in one ear from the Yaesu, and one from the Elecraft in the other. I used the 300Hz filter in the Yaesu, and set the Elecraft's bandwidth to 300 Hz also. I was pretty amazed at the differences. First, the KX3 just sounded better. It was cleaner - the Yaesu has always had a bit of hiss that the Elecraft really didn't have. Additionally, the filter response of the Elecraft seemed much tighter than the Yaesu's - the skirts seemed steeper. The Elecraft seemed about the same as the Yaesu as far as sensitivity goes, which means the rig wasn't the sensitivity limit, the band noise was. But the KX3 could separate signals so much better than the FT817! I listened to a loud station CQing, and in the Yaesu, there was another loud station about 500Hz above that was easy to copy in the Yaesu, certainly loud enough to cover up weak stations - I couldn't even tell he was there in the KX3. Listening to the lower side, the Yaesu seemed a bit better, but still not as good as the KX3. In fact, I heard stations calling the CQer that were covered up by stations below the CQer in the Yaesu - in the KX3, I could still detect the QRM, but it was suppressed enough that I could copy the caller when it was impossible to do so in the Yaesu. Ergonomically, the KX3 seems to do everything right - very little consultation of the manual has been required. Most of that has been for setup of rig that is a bit out of the ordinary - and it's all pretty much set and forget stuff. But the KX3 uses the same LCD display as the K3, so it is plenty readable. The knobs all seem to do what you'd expect, and the alternate functions make sense. All the buttons are plainly labelled. The radio is very easy to use. Dual Watch - very impressive and highly useful when calling DX stations that are working split. I've found it so useful that I've dedicated one of my programmable function buttons to activate and deactivate this feature. Bandwidth Changes - see output power adjustment - and you can crank the bandwidth down to 50 Hz - and it still sounds good that narrow! Sidetone Level - see output power adjustment - sense a theme here? Alternate VFO B Display - the biggest problem with this one is deciding *which* alternate to use. For SOTA expeditions, I can see the clock, battery voltage, and current all being useful...but in that case I think the clock will win most of the time because of paper logging. And at home, I'm sure the VFO B frequency will win. I/Q Outputs - it's very easy to set the rig up an have a panadaptor type display: just connect a stereo cable from the rig to the sound card input on the computer. I'm using NaP3 right now, and it actually displays frequency, and can control the KX3 as well when using a USB connection between the rig and the computer. And do all the DSP if you'd rather use it for that instead of the KX3. I've also just discovered LP-Bridge, which will allow the panadaptor display with proper frequency indicated and rig control via separate logging software. Pretty dang neat. There is a lot more that this rig will do that either doesn't interest me, or that I just haven't discovered yet (I'm about 18 days into owning it). But I can say without hesitation, it is the finest radio I've ever owned. The only nit I can pick with it is that the speaker is small, and it can be pushed into distortion/rattling. But I've found that if I need to be listening that loud, I should probably be on the headphones - problem solved! How does this radio do so much, so well, in such a small package? It's pretty simple really: it's all in the software. You see, the RF part of the rig is really a direct conversion receiver. That's about as far as my true understanding goes, but basically the signal is directly converted to audio and split into two signals that are out of phase(I and Q). From there, the software works its magic - the radio is really an SDR - software defined radio. What's different from the way many hams think of that is that the processing part is built into the radio's hardware rather than in a separate computer. It allows for easy change and update of the radio's basic function with simple software upgrades (note that "easy" and "simple" are from the end users' perspective!). The KX3 has performance that rivals and even exceeds all of the top of the line radios for considerably less money with one exception: power output. But, if you're a dedicated QRP operator, that isn't a limitation at all, and in fact, you're not paying for something you won't use. Elecraft is working on an external power amp for those who are interested in using this radio at a higher power level, but it hasn't been released as of this writing. My FT817ND will be for sale soon.